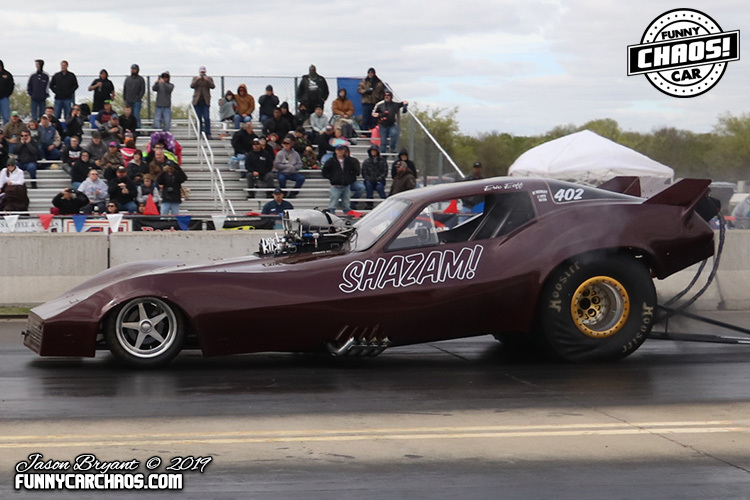 The long awaited season opener of the 2019 Best of Texas BBQ Sauce Funny Car Chaos Championship Tour presented by Red Line Shirt Club kicked off at North Star Dragway in Denton, Texas on March 29th-30th. 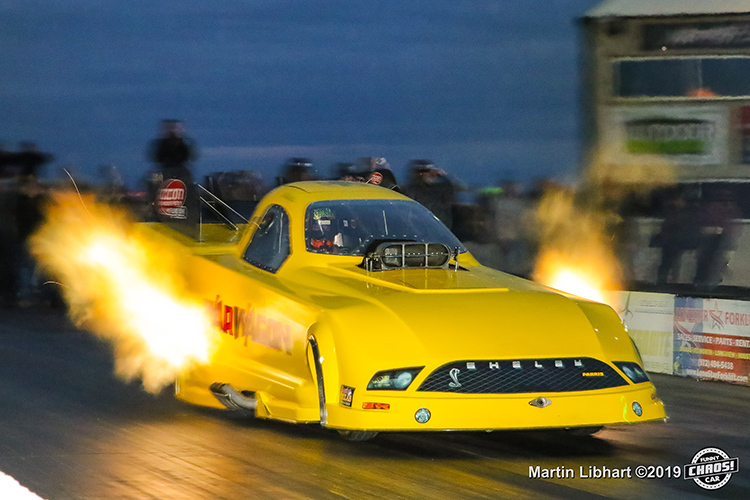 A wild weekend of racing was showcased as funny cars of all kinds took the stage under tricky and rapidly changing weather conditions in North Texas. 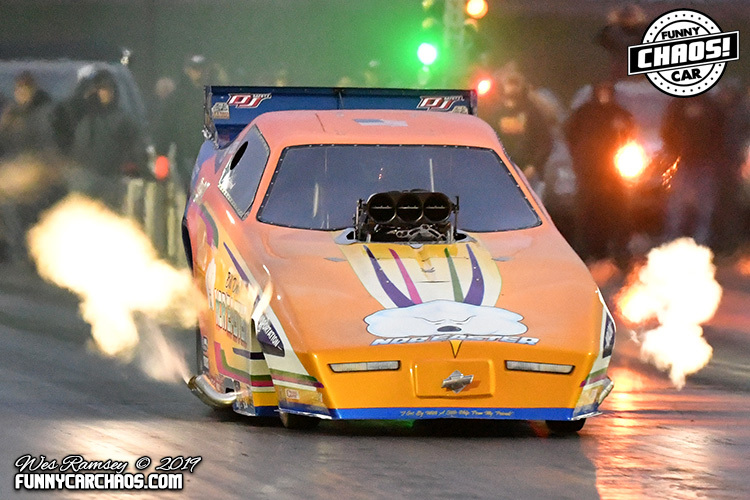 With twenty funny cars on the property eager to battle for a spot in the sixteen car qualified program, the pressure was on for those looking to make a Championship run in the new season. The biggest news during the off season was the expansion to seven races and the debut of the new points program, which will pay the top five finishers at the end of the season including a $5,000 prize to the inaugural Champion. With that also comes a uniform approach to the event format in 2019. All seven events on tour will qualify the quickest sixteen cars. That field will then be split into two fields of eight, an 'A' and 'B' field. Those two fields will compete on a full elimination pro ladder to determine two winners for each event. Points will be awarded equally within those fields, giving all series drivers equal opportunity at the Championship title regardless of which field they qualify for. After the drivers meeting and optional test session were completed on Friday afternoon, it was time for the gloves to come off as two official qualifying sessions were on tap under the lights. With legendary Grand Marshal "The Hawaiian" Roland Leong in the house meeting and greeting fans courtesy of the Red Line Shirt Club, and temps in the middle sixties with a large degree drop forecasted for Saturday morning, the Friday night sessions stood out as the time to lay down numbers under prime track conditions. Ken Singleton's Oklahoma based "High Risk" alcohol burning Monte Carlo was the first car to dip into the threes with a 3.99 at 198 mph. Singleton came into the event undefeated in FC Chaos competition and with a target on his back after his three wins last season. 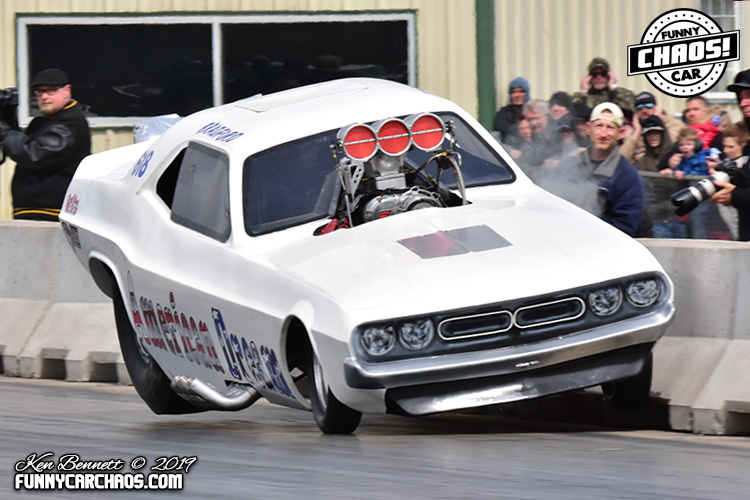 Nick Poloson wheeled Gary Doak's "Bucket List" from Kerrville, Texas to a career best 3.90 at 187 mph to secure his spot in the Rodak's Custom Coffee 'A' field. Allan Middendorf clicked it early to a 3.96 at 144 mph in the new look "American Outlaw" from Illinois as the teams returned to the pits to prepare for Q2. 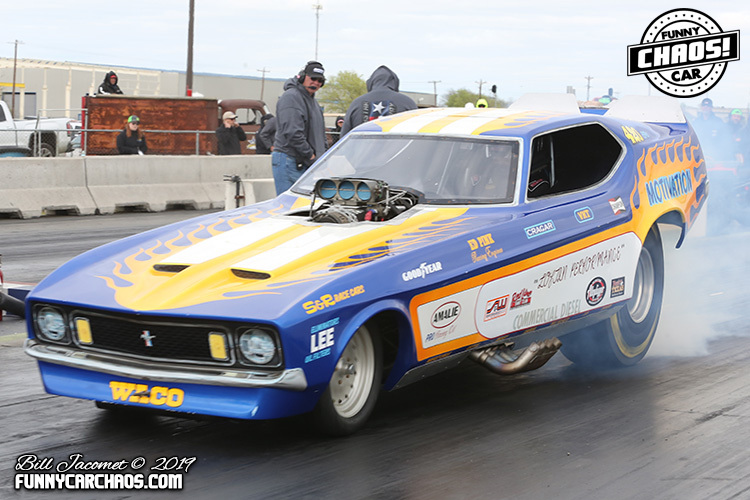 In the second session of qualifying, Ronny Young put the local favorite "Blue Max" into the top eight with a 3.99 at 190 mph with header flames trickling from the pipes. 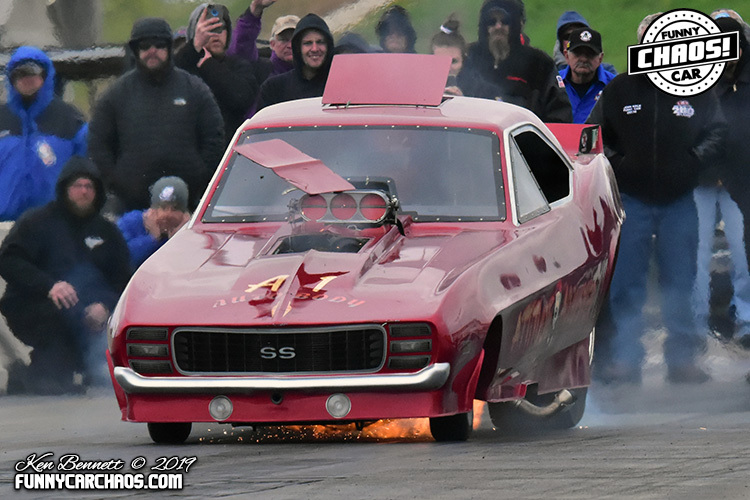 Mark Billington's "Sons of Thunder" big show TA/FC legal entry posted a nice 3.89 at 191 mph to qualify number two after Friday night, but the car in the other lane stole the spotlight. 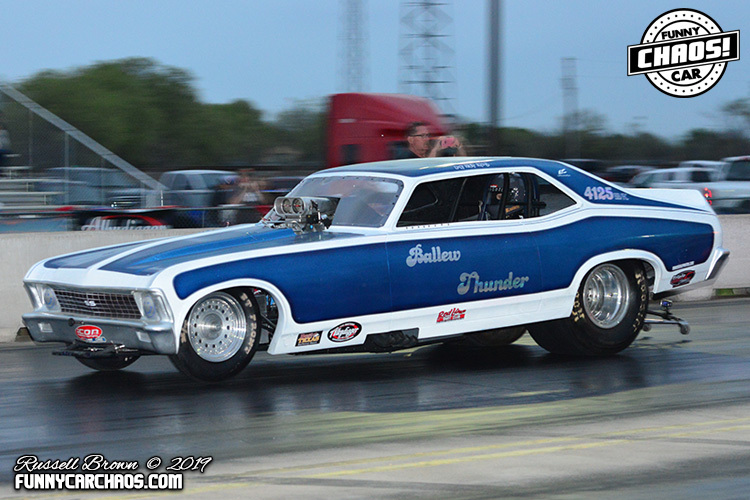 Allan Middendorf ripped off a ground pounding 3.59 at 195 mph, just six hundredths off the North Star Dragway track record, which catapulted his Jake Sanders tuned entry to the top of the charts after Friday night's action. There were plenty of go fast hot rods in the pits ready to challenge the top eight, but with very little testing opportunity prior to the event, many teams had some bugs to shake out as they returned to the pits to prepare for the final qualifying session and eliminations to follow on Saturday. With a new day came a new forecast as temperatures plummeted into the upper 40's and winds picked up to 20-30 mph. 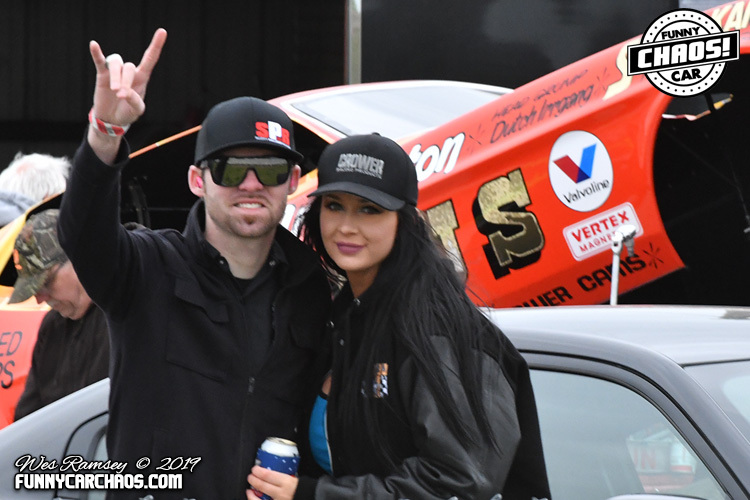 Thankfully rain was not an issue and despite the cold and windy conditions, die hard funny car racers and fans turned out to see the Chaos unfold and were not disappointed in the show the teams brought to the stage on day two of Funny Car Chaos at North Star Dragway. 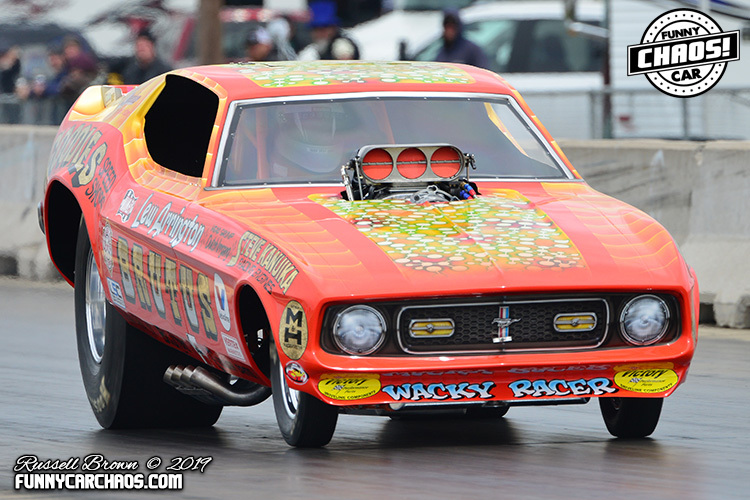 Chuck Loftin was making his nitro funny car competition debut in a 1971 Mustang bodied nitro burner from Seguin, Texas. 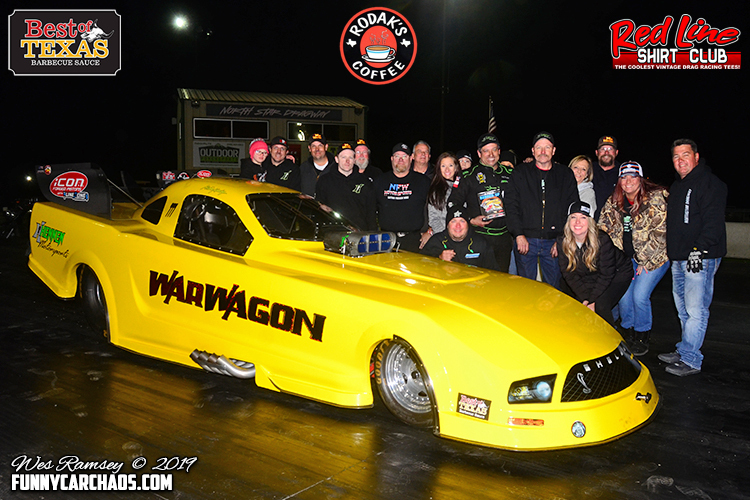 With tuning assistance from Terry Haddock, Loftin clicked off a clean 4.23 at 166 mph to slide into the Rodak's Custom Coffee 'A' field. Kebin Kinsley was behind the wheel for the debut of the "War Wagon" ex. 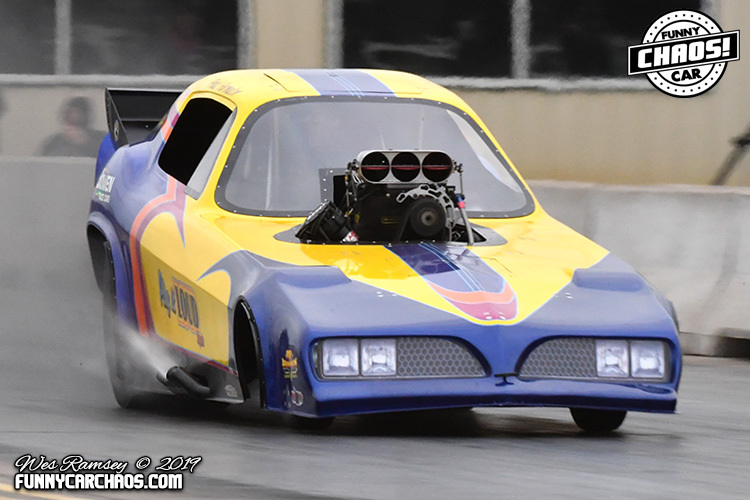 Bob Tasca machine owned and tuned by Howard & Shane Farris from Springtown, Texas and after a mighty struggle on Friday, the team posted a strong 3.78 at 201 mph to slide into the top eight behind Middendorf. 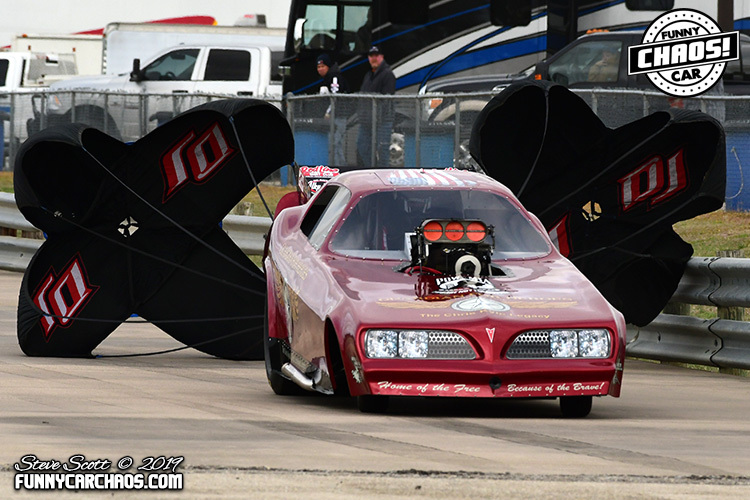 Brandon Lewis was making his nitro funny car debut in the ex. John Hale entry now branded "Attitude Adjuster" and with tuning assistance from Guy Tipton was able to use a 4.57 at 118 to claim the top qualifying position in the AlkyDigger 'B' field. Tod Barker, Fred Farndon and Jeff Cameron rounded out the top half of the 'B' field ladder while Rick Grindstaff, Damon Kuhn, Robert Slaughter and Dustin Bradford came up short of a spot in the quick sixteen bump spot held by Clay Cunningham with a 5.16 elapsed time. With over 40 Dirty South Gassers in the house from across the southwest, a 20+ car field of local Old School Backhalf racers, fuel altered match racing, jet dragster exhibition by Ray Kelley and the exciting test pass scheduled by the Hennen Motorsports Top Fuel Dragster, also driven by Kebin Kinsley, the temps might have been chilly but the on track action was hotter than ever. Under the watchful eyes of series creator Chris Graves, race director Bubba Corzine and announcements by series broadcaster David Rattan, it was time to post the ladders and pair Funny Cars for the first round of eliminations. Opening the action in the Rodak's Custom Coffee 'A' field was "Mr. Undefeated" Ken Singleton alongside Mark Billington in a battle of three second alcohol burners. Billington went red off the line while Singleton clicked off his best pass of the weekend with a 3.77 at a whopping 204 mph, just four mph off the series record. 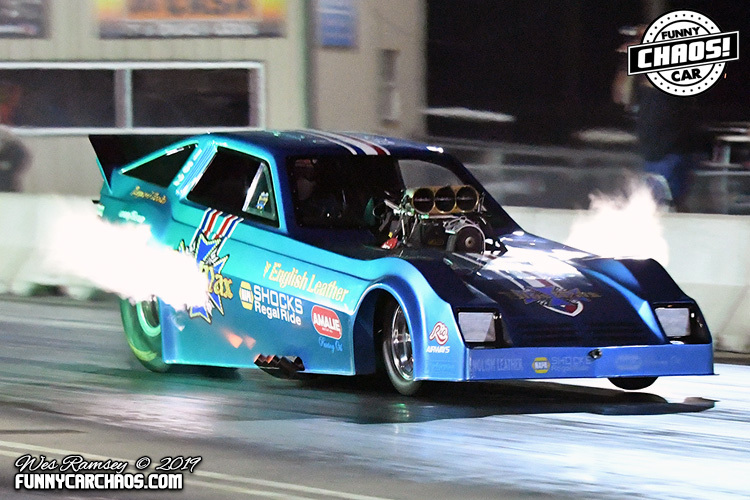 Ronny Young and the "Blue Max" was out next with Nick Poloson in the "Bucket List" staging up in an all nitro affair. Poloson blasted off the line and never looked back, improving on their career best with an impressive 3.79 at 198 mph to move into the semis. 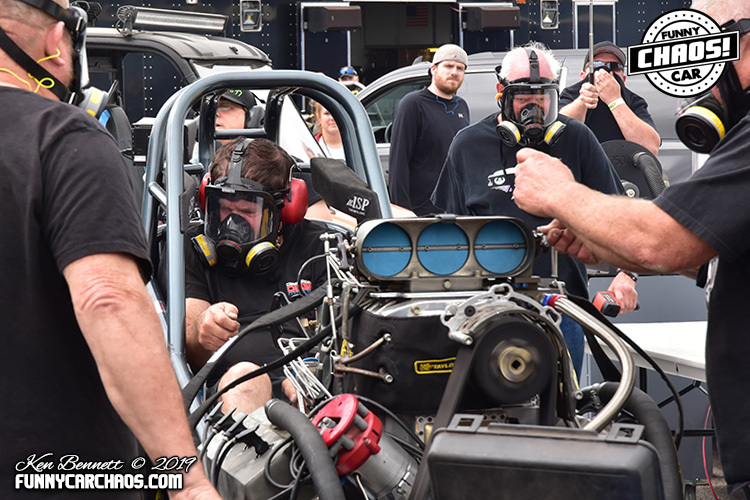 Chuck Loftin and Kebin Kinsley came to life in the next pair but during the burnout, a broken throttle cable ended Loftin's hopes in a match he would have likely won, as Kinsley went into severe tire shake early and coasted to a 6.26 win light. In the final pair of the 'A' field, Allan Middendorf's "American Outlaw" and Nancy Matter's "Guardian" came to the line. Matter took a large advantage off the line but immediately smoked the tires, while Middendorf also began to have issues. 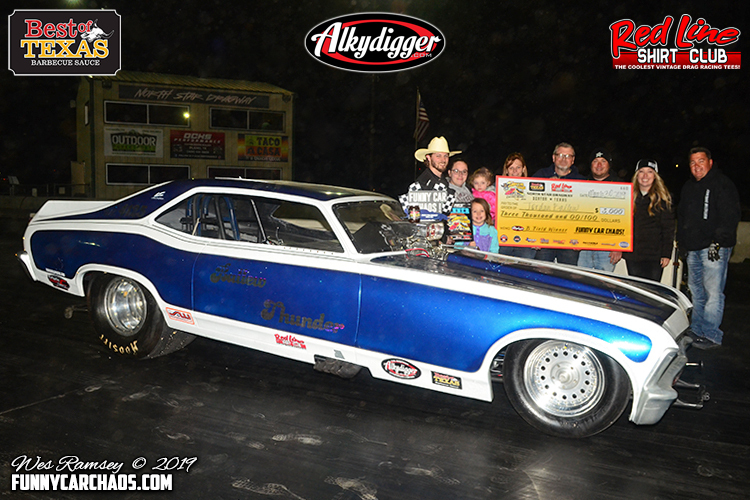 A few pedal jobs for Middendorf secured him the win light as the semi-finals were set for the 'A' field eliminator. In the AlkyDigger 'B' field, Clay Cunningham's "Still Crazy" alcohol burning Dodge Daytona from Dumas, Texas lined up with top qualifier Brandon Lewis. At the drop of the ambers, all eyes were on Lewis as the car smoked the tires and "ziiiiing - boom" blew the burst panels in wild fashion while Cunningham's 5.15 advanced. 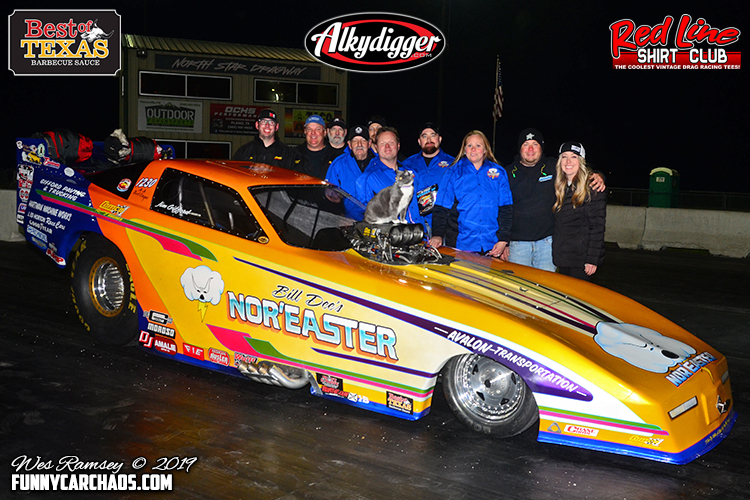 Jim Gifford had been playing it quiet behind the wheel of Bill Dee's "Nor'Easter" who made the long haul from Massachusetts to race at the Chaos season opener. Having only made one qualifying run, Gifford and tuner Mike Smith were the great unknown in the 'B' field but quickly made a statement with a 3.98 at 188 mph to defeat Jeff Cameron's "Magnolia Missile". 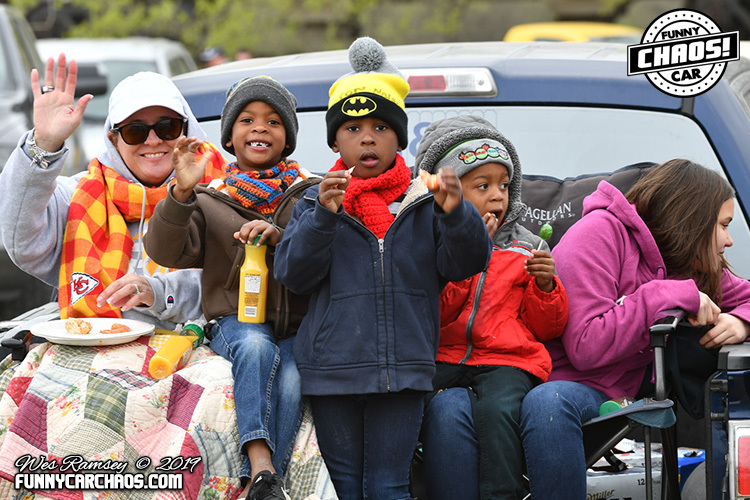 Cameron's team didn't leave without a smile as their back up girl Ashley Maynard took home the "Best Dressed Back Up Girl" bonus money showing true dedication by staying in costume despite the very chilly conditions. AlkyDigger 'B' field eliminations continued with Eric Eoff's "Shazam!" Corvette nitro burner lining up with Tod Barker's "Back in Black" alcohol burning Corvette. It was all Corvettes all the time, but Barker ran into issues on the starting line while Eoff was a bit late to the line, yet able to post a 4.94 at 147 mph to take the win. Wrapping up the opening round, "Dry Hop King" Jordan Ballew brought his Oklahoma based alcohol burning Nova to the line alongside fellow Okie and nitro veteran Fred Farndon. In what most would agree to be the wildest drag race of the event, the cars were nearly dead even off the line, both had issues just before half-track, Farndon made a move to the front and was off the throttle at the top end hoping he'd done enough, but Ballew blasted by at the stripe and took the win with a 5.08 at 137 mph to Farndon's 5.09 at 111 mph. Margin of victory just .007 at the stripe. Between rounds of 'A' field competition, a screw was found in the rear slick of the "Bucket List" driven by Nick Poloson requiring an unexpected tire change. Thankfully the team had a set mounted, yet it was an un-preferred backup set from last year, as the team hoped that change wouldn't throw off their momentum after back to back career best runs in their match up with number one qualifier Middendorf. As the sun set and the temps began to drop even lower, the 'A' field was on the line as Poloson took a massive starting line advantage but immediately went into tire smoke. In the other lane, Middendorf again struggled to find traction on the cold surface as the pedal fest was on. Despite his best effort, Poloson's 163 mph blast came up short at the stripe as Middendorf coasted a 5.47 at 83 mph win. Kebin Kinsley was fresh off a test pass in the Hennen Motorsports Top Fuel Dragster which resulted in an early shutoff 3.92, now strapped back in the "War Wagon" and lined up with that wicked alcohol burner of Ken Singleton. 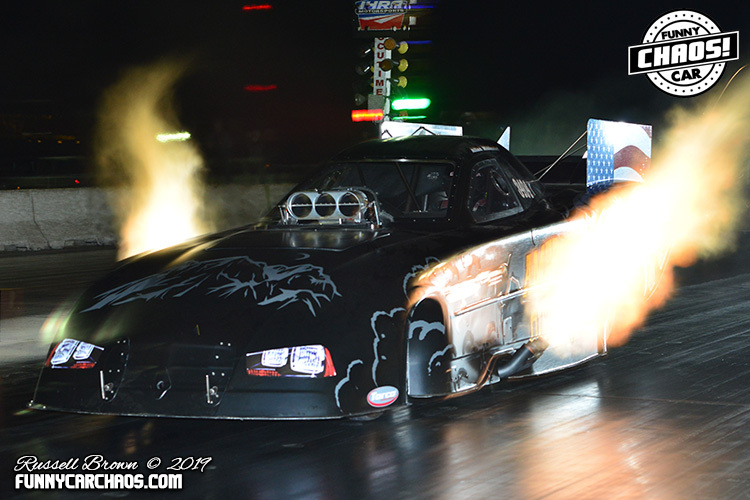 The ambers flashed and a -.016 red light for Singleton ended his undefeated streak, which was capped off by a little tap with the guardrail as sparks flew, while Kinsley used a pedal job to regain traction and click off a winning 4.17 at 190 with header flames past the roof through the finish line. Whew! It was the two top qualifiers, Middendorf and Kinsley, final round bound. AlkyDigger 'B' Field semi-finals were up next as Jim Gifford and Clay Cunningham came to life. Cunningham knew he needed all he could get off the line but a -.012 red light was just too much as Gifford posted a clean 4.08 at 180 mph to put the Bill Dee's "Nor'Easter" in the final round. 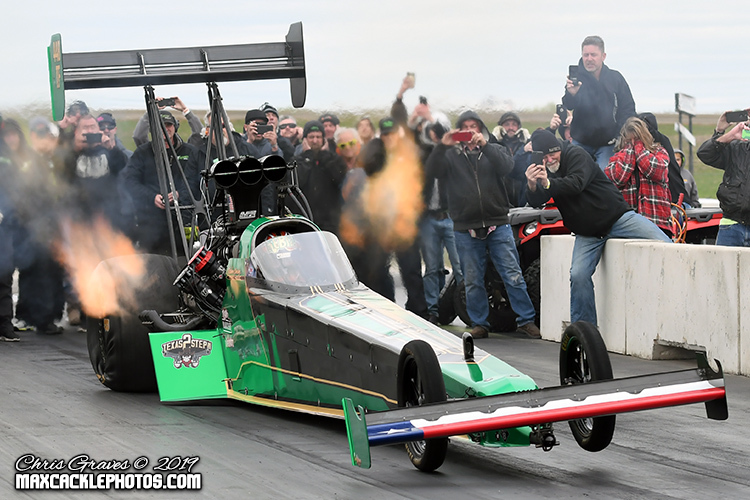 Jordan Ballew was set to take on Eric Eoff, but Eoff was sidelined with mechanical issues and with temps dropping fast, Ballew safely shut it off before half-track on his competition bye run and coasted to the final round with a 6.25 at 72 mph. Services between rounds were completed as quickly as possible as temperatures were on a steady decline and safety a top priority. Track prep and maintenance continued as the staff at North Star Dragway stayed on top of the surface as funny cars arrived to the lanes and suited up for the finals. Jordan Ballew yet again was set to take on a nitro burner, but found his opposing lane empty as Jim Gifford and company suffered parts damage in the semi-final round win and were unable to make the call. In similar fashion to the semis, a wise and safe competition bye run was at hand for Ballew as the team from Bartlesville, Oklahoma captured their first AlkyDigger 'B' Field Funny Car Chaos win! The Ballew team is the only team on the planet to enter and compete in all six Funny Car Chaos events in history and with plans to compete in all seven this season, this win is not only a memory they'll never forget, but will play a big part in their hopes for a Championship run. One down, one to go. 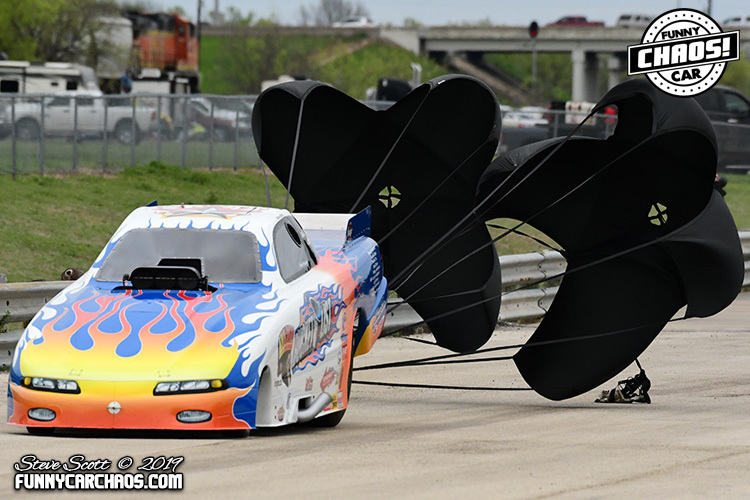 The battle of the big power, big pump, big flame outlaw funny cars of Allan Middendorf and Kebin Kinsley. No one knew what to expect in this one, but all things considered, it was sure to be Chaos. 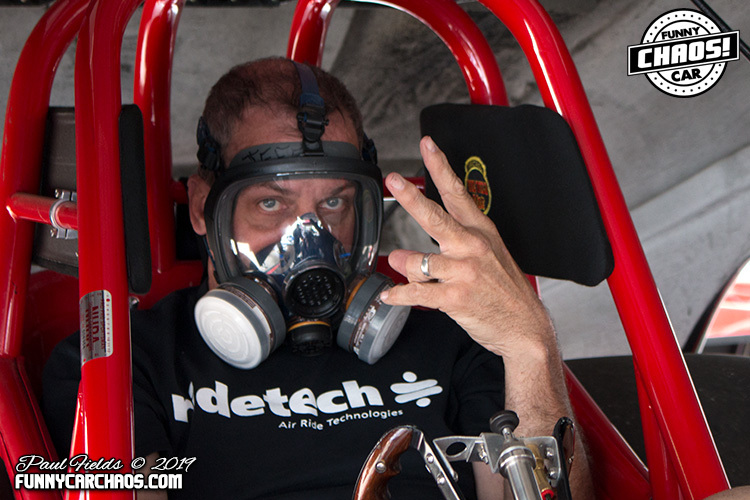 With the thumbs up from track chief starter David Strickland, the sky quickly filled with nitro fumes as the cars came to life. Backing up from the burnouts, the die-hard fans remaining were on their feet and after final adjustments from the crew chiefs, the drivers pulled into the beams. Kinsley rolled it in deep and crept just out of the last beam turning on the red light, while Middendorf was green and again was forced to pedal to a 4.89 at 115 mph while Kinsley also used a quick pedal to click off a 4.10 elapsed time. Despite the red light, Kinsley and company set the new series mile per hour record in the final round with an incredible 214 mph blast. 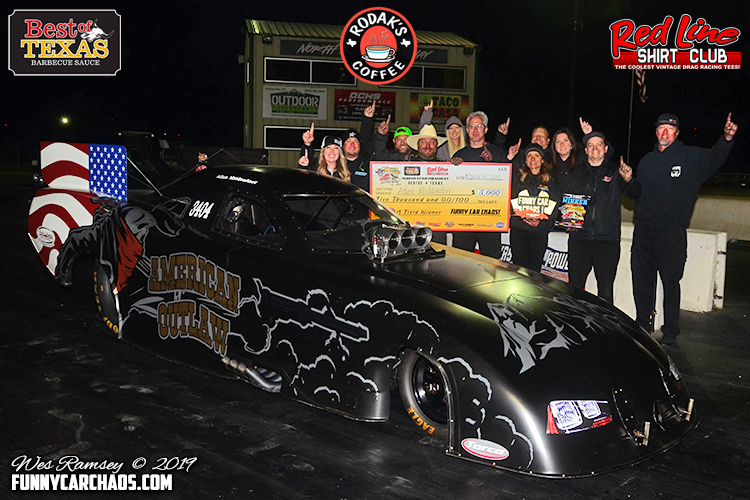 So Kinsley took home the mph record, Middendorf took home the elapsed time record and the Rodak's Custom Coffee 'A' field $5,000 win, and the season opener was now officially in the books in Texas. Allan Middendorf is your early points leader followed closely by Jordan Ballew and Kebin Kinsley with Jim Gifford and Ken Singleton rounding out the top five. "I think this series is the hottest thing going right now. We're digging these smaller tracks and meeting these fans and racers at Funny Car Chaos. Everyone is very personable and that's the kind of crowd we are excited to be able to race with. Coming out on top at this one is very exciting and we look forward to the rest of the season. I'd like to thank my crew chief Jake Sanders and Snake Enterprises, Torco Lubricants, Vinyl Images, and Allen Bridges for encouraging me to step out and own my own team and to everyone who's helped me get to this point. I also want to thank Chris & Tera Graves for giving all of us a place to race with this series, it's a really exciting program. We're looking forward to seeing everyone again at the next one at Mo-Kan," said Middendorf. 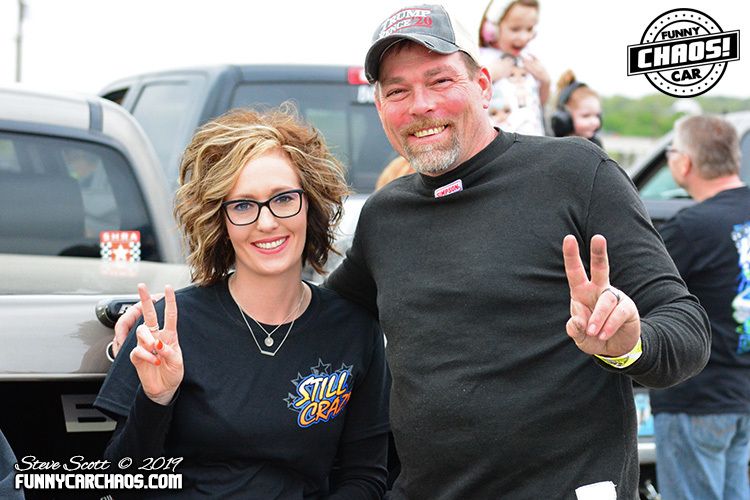 The Best of Texas BBQ Sauce Funny Car Chaos Championship series presented by Red Line Shirt Club is off to a wild start as the second of seven events is just three weeks away. 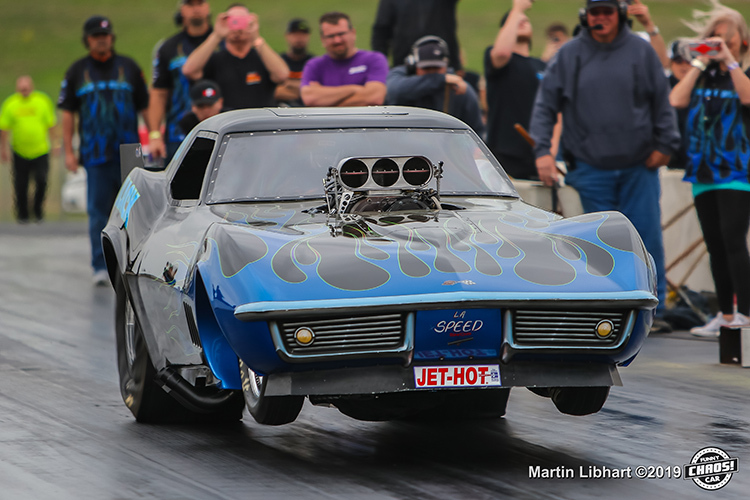 The tour will return to historic Mo-Kan Dragway in Asbury, Missouri and with eighteen cars currently pre-entered and a few on the 'maybe' list, this one is sure to deliver a wild two days of drag racing action. Also on tap at Mo-Kan is more Dirty South Gasser action, a heads up shootout for front engine dragsters and altereds, nostalgia super stockers and more all presented by the Decades of Wheels museum in Baxter Springs, Kansas. The Funny Car Chaos tour would like to thank these additional marketing partners for their support of the 2019 season: Official Safety Supplier Taylor Motorsports Products, Official Fuel Supplier VP Racing Fuels, S&W Performance Group, Triple C Agency.com, Meyer Enterprises, Dooley & Sons Hot Rod Shop, Precision Reprographics, Littlefield Blowers, Still Crazy Racing, Mears Mazda Volvo, Tony Lewis Collision & Paint and Max Cackle Photography. For more information on the 2019 Best of Texas BBQ Sauce Championship Tour presented by Red Line Shirt Club, visit www.funnycarchaos.com.